I'm still working on the 'elevator speech' about what I do here on this blog. At work the other day I was trying to describe this to Sharon (I'm paraphrasing here). Me: I blog about feeding my family from the CSA farm share. Have you heard of a Community Supported Agriculture farm share? Sharon: No. What is it? Me: It's where you pay the farmer a chunk of money in late winter/early spring when they are gearing up for the season, and in return you get a box of vegetables each week during the growing season. Sharon: My friend did that . . . she got kohlrabi. What do you even do with kohlrabi? Me: Sushi! Pizza! See, that's why I started the blog! I've been figuring out how to use the fresh veggies from the farm share for so many seasons that I've got several ideas for kohlrabi! I hate to waste food. My elevator speech may not be slick or smooth--yet--but the conversation reminded me that I made a couple of kohlrabi pizzas that I'd like to share with you. 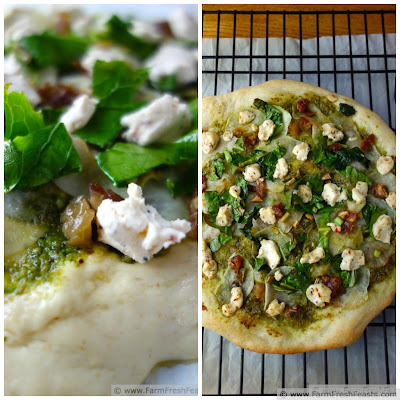 I'd already made pizza using the greens from kohlrabi (of course they're edible--not just for composting pigs or worms, just like chard stems) but I was intrigued at the thought of shaving wafer-thin slices of kohlrabi onto a pizza pie. As usual, dithering ensued, so I'm sharing a pair of pizzas--with or without meat. I was a mite ambitious this particular Friday Night Pizza Night, and to keep track of what all went on each one I ended up scribbling the toppings on the parchment paper. Who knew parchment paper was good for more than preventing my children from hearing unsavory language when I attempt to transfer the dough into the oven keeping the dough from sticking to the peel? Refer to my Pizza Primer post for hints, tips, collages, and general making-pizza-at-home advice. Possible veggie combo toppings: 1/4 cup prepared pesto, 1 Tablespoon chopped dates, 2 ounces crumbled goat cheese (I used tomato-basil). Preheat oven to 450 degrees Fahrenheit, and if you own a pizza stone take it out of the box and put it into the oven as well. If not, use a cookie sheet. On an oiled sheet of parchment paper, stretch the dough into the shape that pleases you today. Brush with olive oil. Set aside. Chop the leaves off the kohlrabi bulb and slice into ribbons. Remove the thick stems (worms love them). Peel the kohlrabi bulb. Using knife skills I don't possess, or a mandoline or Benriner (which I do possess), shave wafer thin slices of kohlrabi. Preheat a small skillet over medium heat. If you're making the meat pizza, place the pancetta into the preheated skillet and cook both sides until crispy and browned. Then there's enough fat in the skillet to sauté the kohlrabi leaves until bright green. If you're making the veggie pizza, add a turn of oil to the skillet and sauté the kohlrabi leaves until bright green. To top the meat pizza: layer slices of kohlrabi bulb across the oiled dough. Top with caramelized onions and sautéed kohlrabi leaves. Scatter crumbles of crisp pancetta and then Manchego cheese over the rest. To top the veggie pizza: spread dough with prepared pesto. Layer slices of kohlrabi bulb over top, then caramelized onions, sautéed kohlrabi leaves, chopped dates, and finally bits of goat cheese. To bake: slide the whole thing, parchment and all, onto a preheated pizza stone or a cookie sheet. 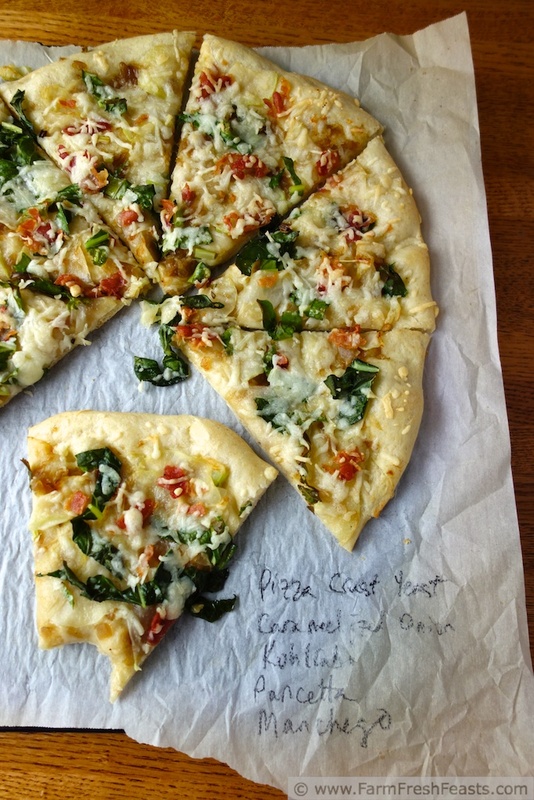 Bake 5 to 8 minutes, then shimmy the pizza off the parchment (save for labeling for your photos!) and continue baking another 3-5 minutes until shredded cheese is browned and bubbly or goat cheese is soft and crust is beginning to brown. Cool, slice , and serve. NOTE: If you look closely, you'll see "pizza crust yeast" which is my shorthand for the packets of Fleischmann's pizza crust yeast that I've bought (on sale with coupon! score!). I like to use this when I forget to have dough resting in the fridge, because the resulting pizza dough fights me less than a freshly-made dough using regular active dry yeast. I'm not paid in yeast or cash to say this--it's just a good product, if you can find it, for those times when you want to make a dough and bake it right away. There are coupons in the holiday baking couponpalooza, too. 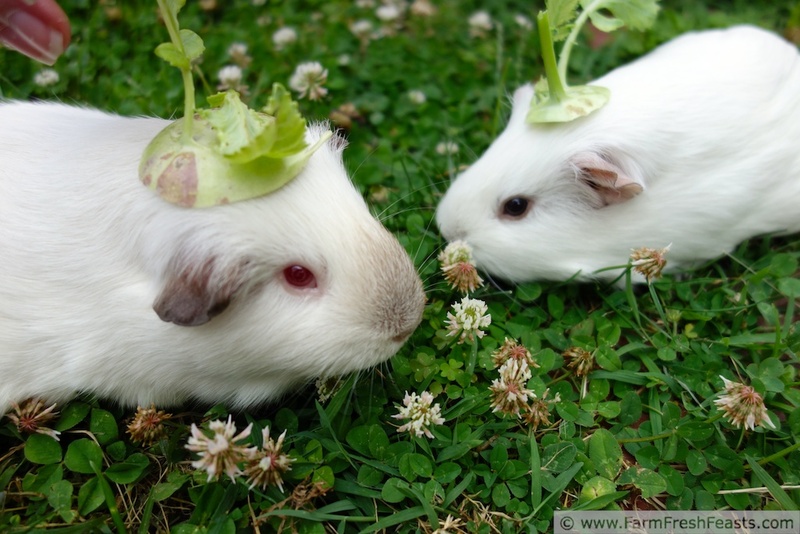 And since they look so cute in their kohlrabi caps, here's a shot of Quartz and Crystal. They would not cooperate and eat the kohlrabi when I placed them in their favorite clover patch--gave me the stink eye instead--but I did manage to get one shot of them. I think Quarty looked quite smart. 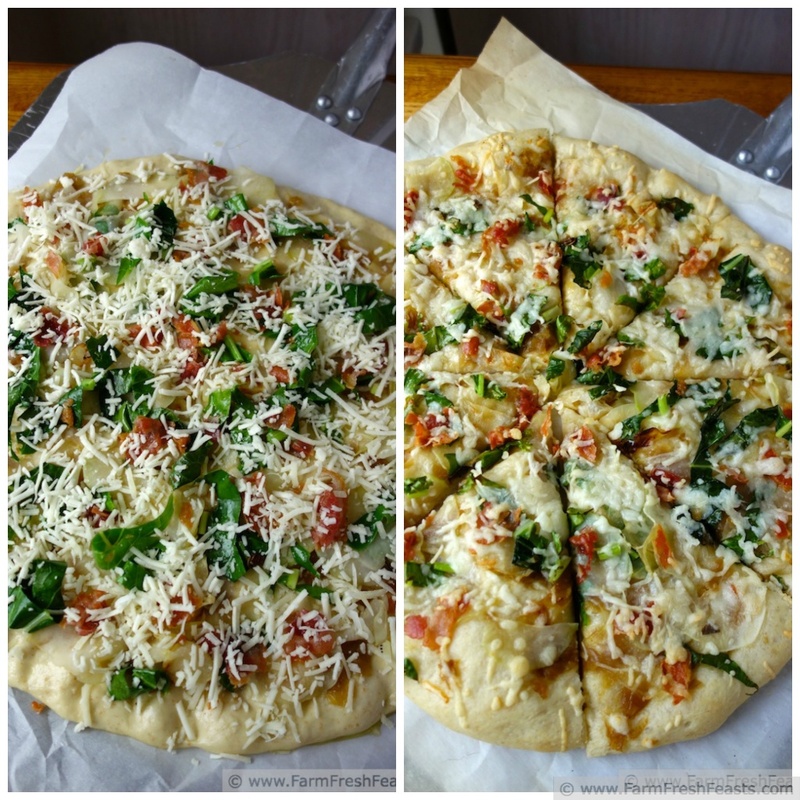 This pizza is shared with the From the Farm Blog Hop, Clever Chicks Blog Hop, Tasty Tuesdays, Wednesday Fresh Foods Link Up, What's Cookin' Wednesday, and What's In The Box. Haha - love it when Quartz and Chrystal show up! FYI - my old CSA didn’t follow the “pay up front” model and I understand that more and more are not, just week to week or month to month. PS You are the pizza queen, my friend! I'm glad to know more CSAs are being flexible with their payment options--I know one of the reasons we went with our current CSA was that we didn't need to pay for the weeks we didn't use. We didn't move until July, so it was nice not to pay for May and June when we weren't even in the same state. Alanna's right -- you are the pizza queen! You've made kohlrabi something I would consider eating, which makes you a miracle worker, too. I think you eat a lot more things than my kids do, so I'll consider it miracle working that they'll not only eat, but ask for, kohlrabi--in sushi, and eggplant--in spaghetti sauce. I need to do this next time I get kohlrabi. 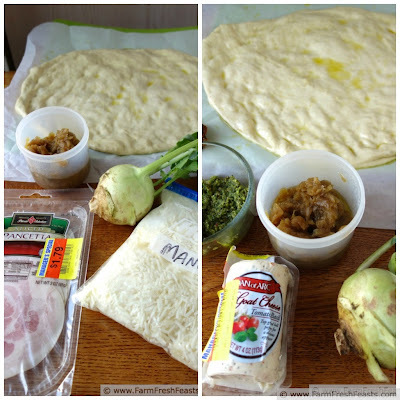 I've done all sorts of creative, crazy things with kohlrabi, but I've never done a pizza. It looks amazing! Kohlrabi is such a blank slate--I think it's pretty cool that you've gotten creative and crazy with it. You've got amazing CSA pizzas, so that is high praise indeed. I'm still working on breaking out of my pizza topping rut. You are my inspiration! Thanks! I predict I'll get into a rut in January-February when I'm out of fresh produce from the farm share and have made a first pass through all the goodies I've put up. I'm glad to inspire you--you inspire me! Never ever would I have thought I'd be excited for my next kohlrabi, but you've done it, which is further proof of why you have a blog. Both Quartz and Crystal do look smart. I'm quite fond of their little hats. It's a great photo and will serve as a lovely memory. Hugs. I love the first picture with the parchment paper and ingredients written right on it. It's perfect. Can I get a woot woot! Excited for kohlrabi! I'm pretty chuffed about that. And if you'd been here with all the multi-ingrediented (?) pizzas what all had something green and something brown on them, you'd've resorted to scribbling on the parchment too. I love kohlrabi. I think it tastes just like cauliflower, which is my favorite veggie. The only thing is that it is a pain to peel. I've never had it on pizza though, it looks delicious! Thanks for the other links to kohlrabi recipes. Have you peeled pie pumpkins or acorn squash? After those joyous experiences, peeling a kohlrabi isn't so bad to me. Maybe I'm just weird for peeling oddly-shaped squash, though. Thanks for the invite (I like link parties! ), and thanks for stopping by! This is a very inspiring idea for kohlrabi! I tried it once, as the main ingredient of a salad/slaw, and just couldn't do it. I wanted to like the taste but just didn't. But I'm sure adding cheese helps, I'll have to try it on pizza. Thanks! Cheese helps with everything. And bacon. Bacon helps with many things. I love that you added kohlrabi to pizza! Thanks for linking up with What's Cookin' Wedneday!! And by 'love' you mean 'think you're strange because you' added kohlrabi to pizza, and you'd be right. That's ok, though, when the farm share gives me kohlrabi, why not make a pizza?